The travel from Camp 1 to Camp 2 is not all that far – however it does pack in some of the most spectacular terrain I have climbed on in Nepal. The ridge itself alternated between snow, ice and rock this year however the traverse sections were free of snow which made things easier. For the most part you are protected from the prevailing westerly winds by being on the eastern side of the ridge. And to top things off, on a fine day it is sunny. So what does this mean – well untill you reach the top of the Yellow Tower and Camp 2 you are pretty much in the sun and protected from the wind. This all adds up to an enjoyable day in the hills. The Yellow tower – this section of rock is the gatewqay to Camp 2 and the upper mountain. 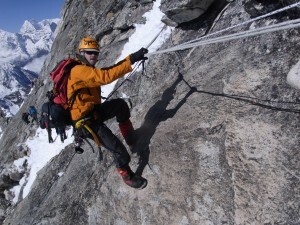 It is a reasonably short vertical section of rock that is negotiated by the use of Jumars and fixed lines. To approach the tower you have arrived at a small legde – often with loads of gear dumped there. You must then attach to the fixed lines – get your jumar as high as possible, get tension on the line and then swing out into space and start to make your way up. There are some small ledges and cracks that give you some purchase but I can guarantee that by the time you jumar up the 15 – 20m section you will be breathing hard and feeling both a bit scared and elated! From the top of the tower it takes less than 5 minutes to reach Camp 2 proper – this a small ledge system atop a rocky spire – there's not much room and this year with all the snow – even less.